Once the source of the moisture is corrected, remediation (mold removal, clean-up, abatement) of the molds/bacteria will be determined by the material that the mold resides on and the area of the affected air quality. The remediation contractor should use Personal Protective Equipment (PPE) to protect themselves againstcontamination. All precautions should be taken to protect the occupants of the home and currently unaffected areas of the home from exposure during remediation. All affected areas must be contained during remediation. The containment should be constructed of a minimum 6-mil thick polyethylene sheathing with the preferred method being a “zipper” containment. Containment should remain intact until a post-remediation report is produced indicating that the remediation effort has successfully solved the problem. Containment should NOT be altered or even entered by any person other than the remediation contractors or the indoor air quality consultant unless specific authorization has been given. All moldy or damaged materials from the remediation project should be placed in sealed 6-mil Polyethylene bags if they are to be transported through “clean” areas prior to disposal. Surfaces such as countertops, hard un-lined HVAC ducts, concrete, glass, plastic, steel studs or joists. The mold can be cleaned with SHOCKWAVE – Disinfectant an EPA registered disinfectant, mold killer with over 140 kill claims. Wood products such as wood studs or joists, paneling, furniture. If the structural integrity of the material has not been compromised and there is access to properly treat, the material may be wire brushed to remove the visible mold and/or bacteria, cleaned with Advanced Peroxide Cleaner, and coated with IAQ-6000 (Clear) or 6100 (white) . an EPA registered mold resistant coating. If structural integrity is compromised or proper access cannot be gained, then removal of the material is necessary to ensure remediation. Gypsum drywall, boxes, paper products such as newspapers & books, cabinets, carpeting, OSB, soft furniture, or other particle-board. It is always best to replace the affected material and dispose of it. Cleaning and HEPA vacuuming may help but is probably only a band-aid. Clothing should be thoroughly cleaned to remove any mold spores. If the clothing is no longer worn, it would be a good time to dispose of it. treat all exposed framing with Advanced Peroxide Cleaner per the guidelines above. 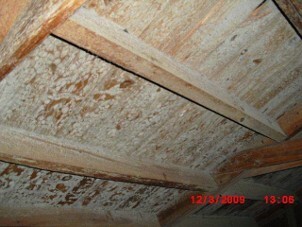 Apply EPA registered Mold Resistant Coating IAQ-6000 (Clear) or 6100 (white) to the affected framing and roof decking. An advanced abrasion technique may be used if the work area is too difficult to sand or wire brush. Fix all water (moisture) intrusions. Erect a proper containment at the attic entry per the guidelines above. Clean and store or dispose of all possessions in the affected area per the guidelines above. Maintain the relative humidity in the work area at 50% or less during remediation. Repair/replace water damaged framing members. Wire brush or sand all affected framing members; treat all exposed framing with Advanced Peroxide Cleaner per the guidelines above. Apply EPA registered Mold Resistant Coating IAQ-6000 (Clear) or 6100 (white) to the affected framing and roof decking. An advanced abrasion technique may be used if the work area is too difficult to sand or wire brush.